It is important to pray and read the Bible daily so that we do not lose contact with God. Join in weekly worship and fellowship as to not isolate yourself from your family of faith. 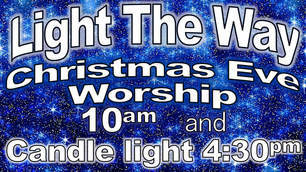 Sermon series: Light the Way Matthew 2:1-12 Taking a God-Led Journey” from Pastor Dave Brown. God’s People respond to God’s call. The Wise men were not about a fresh start but about Worship for ALL people. a) Pay Attention to the signs, the Wise Men saw the Star as a sign. God is giving us signs today – are we paying attention? Who or what is leading you to Jesus? b) Pay attention to the Words of Jesus. Live by them, live out The Words of Christ. Ephesians 5:8-9 (NIV) For you were once darkness, but now you are light in the Lord. Live as children of light for the fruit of the light consists in all goodness, righteousness and truth. Advent week 2; December 10th, 2017 A delightful day of worship today! New Heights Community and Mt Bethel Churches Worshiping together as Children led the way with an reenactment of the Christmas story. Just delightful hearing the story of Jesus’ birth –God with Us from the voices of children. Worship facilitated by Pastor David E. Brown, Message by our District Superintendent, Rev Cynthia Williams. Scripture Psalm 80 Message: “Lord, Return Us, O Lord” After DS Cynthia's message we shared in Communion. November 26, 2017. Message by Pastor David E. Brown: Celebrating the Reformation: John Calvin 1509-1564 “The Sovereignty of God” "I felt as if God from heaven had laid his mighty hand upon me to stop me in my course—and I was so terror stricken that I did not continue my journey." To this day, Calvin's name is associated, for good and for ill, with the city of Geneva. And Calvin's belief in God's election is his theological legacy to the church.” "He [God] tamed to teachable-ness a mind too stubborn for its years—for I was strongly devoted to the superstitions of the papacy that nothing less could draw me from such depths of mire. And so this mere taste of true godliness that I received set me on fire with such a desire to progress that I pursued the rest of my studies more coolly, although I did not give them up altogether." Outside the church, his ideas have been blamed for and credited with (depending on your view) the rise of capitalism, individualism, and democracy. In the church, he has been a major influence on leading figures such as evangelist George Whitefield and theologian Karl Barth, as well as entire movements, such as Puritanism. Day to day, church bodies with the names "Presbyterian" or "Reformed" (and even some Baptist groups) carry forward his legacy in local parishes all over the world. 1) Church: Not an institution but a community of those who had been given faith. “The priesthood of all believers”. ​1. Remember what God has done! Commit to daily Bible reading, Attend church often, Ask other Christians what God has been doing in their life, Take time to ponder the meaning of Christian holidays , Reflect on your spiritual journey. 4. Seek community! Context of belonging, love and support, Our perspective is challenged, We can hear other’s opinion, We come closer to the Truth with the consensus of the many. What step is God challenging me to take today to be a more thankful person? (C) I leave a legacy of honor John 12:25-26 "Anyone who loves their life will lose it, while anyone who hates their life in this world will keep it for eternal life. Whoever serves me must follow me; and where I am, my servant also will be. My Father will honor the one who serves me." ​a) Sacrifice is worship and begins with offering ourselves to God. b) Sacrifice recognizes God is with us, has already blessed us and desires for us to walk with Him. c) Sacrifice is our posture-attitude (of ministry, hospitality and generosity) to the blessing of God as we offer our time, talent, treasure, and witness in service to the Kingdom. Therefore, I urge you, brothers and sisters, in view of God's mercy, to offer your bodies as living sacrifices, holy and pleasing to God--this is your spiritual act of worship. Do not conform any longer to the pattern of this world, but be transformed by the renewing of your mind. Then you will be able to test and approve what God's will is--his good, pleasing and perfect will. Old Testament examples: Sacrifices became a form of religion without the relationship of religion. 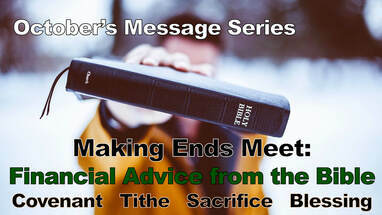 I Samuel 15:22 To obey is better than sacrifice. Hosea 6:6 God delights in loyalty rather than sacrifice. Proverbs 21:3 Righteousness/Justice are more important than sacrifice. Making Ends Meet…..Begins with responding to God’s covenant already made in Jesus: Voluntarily (personal response), Corporately (gathers abundance) , Positively ... It is not by works, it is not by law…it is only by grace. 3) Making Ends Meet… Begins with responding to God’s covenant already made in Jesus. It is not by works, it is not by law…it is only by grace. 1, Any place in our world (or right in our neighborhood), and ask, "What does the community need?" 3, Rooted in the name of Jesus. If you are a Christ follower, you are a missionary. Whether in your home, neighborhood, workplace, or across the globe, it's OUR mission to share the love of Jesus! Jesus is our model for worship that moves us to see the needs around us and respond by serving others. As we go forth to serve, the Risen Lord Jesus leads us and is present with us empowering us to share the Good News with all. Welcome to Worship! We are learning from the Apostle Paul’s “Table Talk” advice for the Christians in Rome. He concludes his lengthy theological letter to the Church with practical, relational advice. May the Holy Spirit empower us to learn and grow in Christ. We Savor God’s Word Romans 14:1-12 “Table Talk, Part III” Being in relationship with each other and addressing conflict. How do we disagree? Apostle Paul's guidance. 1) acknowledge there are disagreements, different perspectives. Recognize personal weaknesses. 2) don't treat others with contempt. Practice humility. 3) remember we are on Holy Ground. The earth is Holy Ground, created by God. We live to the Lord - together- United we stand! September 10, 2017 Pastor David E. Brown We are learning from the Apostle Paul’s “Table Talk” advice for the Christians in Rome; today Romans 13:8-14 “Table Talk, Part II”. Paul's letter to the Church is packed with practical, relational advice. May the Holy Spirit empower us to learn and grow in Christ. Especially when we feel the weight of storms barring down on us. Also, Thank you First Responders - no words are adequate to express our admiration and gratitude for the women and men who run towards danger to save others - humbly, grateful. Love generously. Be the light in deeds of darkness. Be in Love Action. Pay Love back by paying Love forward. September 3, 2017 Pastor David E. Brown Welcome to Worship! For the next few weeks we will be looking at the Apostle Paul’s “Table Talk” advice for the Christians in Rome. He concludes his lengthy theological letter to the Church with practical, relational advice. We have much to learn from him. Welcome to Worship! The character of a Christian matters. It is our high calling in Jesus to live as He desires. We will learn more today about how to live out this life together as we worship God. August 20, 2017 Pastor Dave Brown. Welcome to Worship- Pastor Dave is back from two and half weeks out West. ​Praise, Pray, Preach. Message/Scripture: " Advice from a Train"
​… surrounded by God's love, blessed by peace, and filled with abundant joy. August 13, 2017 Guest leader: Catie Levenick has been working in youth ministry for 5 years, serving currently as director of Youth & Family Ministry at Stewartville United Methodist Church. She is also in the process of becoming a Licensed Local Pastor. Catie first met Pastor Dave as a STORM Camper in 2005, and has been involved with STORM ever since. Catie is married to Brad Levenick. They have a son and three “fur children” (2 dogs and 1 cat). Welcome to Worship! We are continuing our exploration of the meaning of “church”. As we rediscover who we are, may we apply that knowledge and understanding to our life together as the Body of Christ. Scripture/Message: Luke 8: 26-39 At the Feet of Jesus. August 6, 2017 Guest leader: Jeramy Girard is in his final year at Luther Seminary where he is preparing to be ordained as an Elder in the United Methodist Church. Jeramy and family live in Northfield. 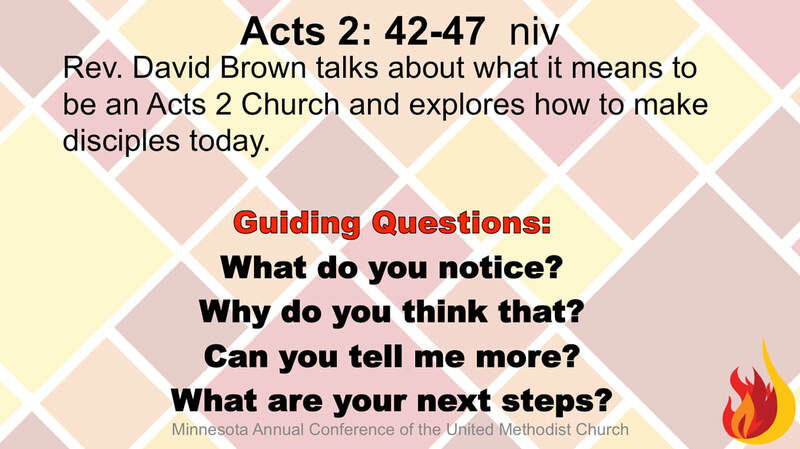 Worship today, we continue our exploration of the meaning of “church”. As we rediscover who we are, may we apply that knowledge and understanding to our life together as the Body of Christ. Prayer: Loving Father, You have shown Yourself faithful to Your people throughout all generations. Help us to be strong in the Lord and to rely on You in all problems of life that we may face, knowing that You are with us. In Jesus name we pray, Amen. Scripture/Message: Joshua 1: 1-9 “Courage In Transition” Jeramy Girard -God is with us! -Trust in God's promises. -God promises to be with us in transition. a) Relationship within the life of "Church" is reflection of Jesus and God's relationship. b) Our "together" (Unity) relationship is a witness. Unity is evangelistic. c) Unity is empowered by the Holy Spirit. d) This kind of "Unity" reflects the Love of God. 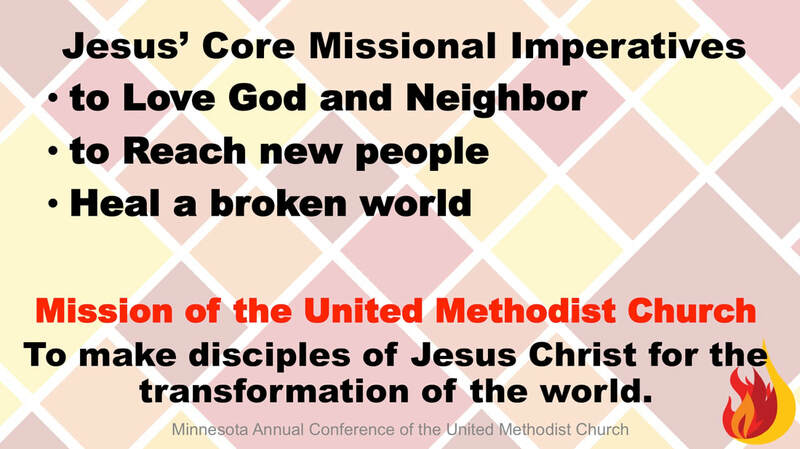 Working together to accomplish the goal of Faith in Christ ... make disciples of Jesus Christ for the transformation of Inver Grove Heights and the world. July 23, 2017 Welcome to Worship! We are continuing our exploration of the meaning of “church”. As we rediscover who we are, may we apply that knowledge and understanding to our life together as the Body of Christ. Peter's Vision Book of Acts 10:9-23 Message: “ ‘The Church’ Is Open to All” Pastor Dave called on attenders to help him deliver the message of "church" and our life together as the Body Of Christ. July 16, 2017 Welcome to Worship! We are continuing our exploration of the meaning of “church”. As we rediscover who we are, may we apply that knowledge and understanding to our life together as the Body of Christ. July 9, 2017 Welcome to Worship! We continue our message series on the nature of the Church today. We are doing something new today…Pastor Dave is in Stewartville, Minnesota preaching for STORM Camp. We were hoping to get video of the message, but have opted instead for the Ted Talk video from Annual Conference session two weeks ago. Enjoy worship! scripture: Acts 2:42-27 2:42 "They devoted themselves to the apostles’ teaching and to fellowship, to the breaking of bread and to prayer." ​Following Pastor Dave's TED Talk, reflection. Do we practice disciple making? If so, can we do it better? What does that look like? The mindset for the TED Talk comes from 2017 Annual Conference, click here to view Bishop Ough message. Click here to view Ted Talk. Acts 2:42 "They devoted themselves to the apostles’ teaching and to fellowship, to the breaking of bread and to prayer." July 2, 2017 Welcome to Worship! We are beginning a new series on the nature of the Church today. As we learn and grow together, we will reflect more and more the Body of Christ. Welcome to Worship! Summer has started and we are blessed. May God be present and real to us as we worship. June 18, 2017 Ruth 4 We lift this day our gratitude for the loving men who have brought us the precious heart of God’s love. We give thanks for those who have shown us: kindness, courage, generosity, truth, compassion, faith and love. Happy Father’s Day! 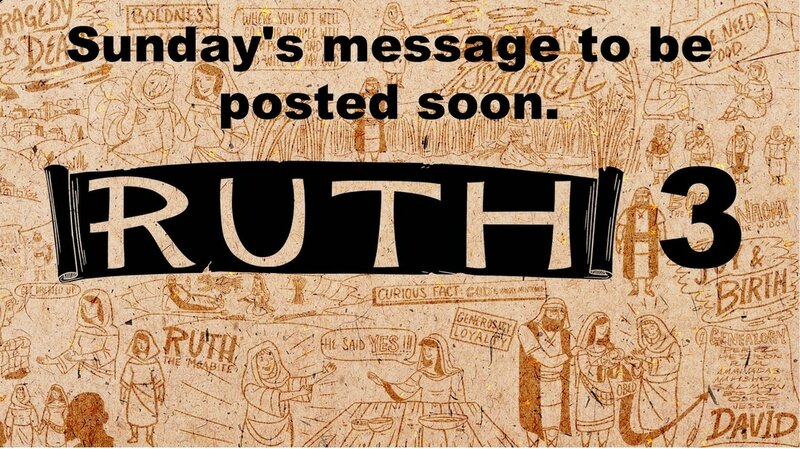 We finish up the book of Ruth today, we are reminded to take the long view as we look at life. Don’t give up on God. When we think He has given up on us, He just might be preparing to do something better than we expect. The more the world seems unstable, the more we see God’s love is stable. I follow Jesus by looking at the big picture of God’s work. Is there something I’m doing to hold someone back? Is there someone in my life I need to trust more? Is there an area of my life where I need to be all in? I follow Jesus by letting go, listening to others, being all in. Bummer - forgot to hit 'record' for the 6/4/2017 worship service. Sorry, no video for this week. As Lisa Rambo did daily as she was a contestant on The Biggest Loser, you too read Philippians. A good news 20 minute read and the Holy Spirit will encourage and transform you too. June 4, 2017 Pentecost Sunday On the Day of Pentecost, Acts 2 the disciples were gathered together in an Upper Room. They were waiting for a sign from God. At the sound of a mighty rushing wind, the Holy Spirit descended upon them. Like tongues of fire, the Holy Spirit rested on each one of them. That day the disciples were changed forever. When the Holy Spirit touches us, we can never be the same. Changed. God comes to us in the presence of the Holy Spirit that we might be enabled to do God's will in the world. Change us, Lord, that we might feel the presence of the Holy Spirit. Set our hearts on fire for you, not just today, but every day. * * New Heights Community Church worshiped with us today- The Church together! Pastor Dan Schauer lead communion and our message, from Lisa Rambo who was a contestant on 'The Biggest Loser'. A message of hope, change. Testimony rooted in Philippians. Lisa read it daily for the 6 months of 'The Biggest Loser' where she transformed herself to the Biggest Winner. Pastor Amanda Lunemann from Good Samaritan United Methodist Church, Edina facilitated worship. God of life carries us through the "wilderness" of... fears, anxiety, health, loss, daily living. The "if only's".... God's got you. "Draw near" to God ... God sustains you. Sixth Sunday of Easter: Welcome to YouTube Worship! We continue the look at the book of Ruth, seeing in Boaz a man of Character. Fifth Sunday of Easter: Welcome to YouTube Worship! We continue to celebrate the core of the Christian faith … the Good News message of Easter…Christ is Risen! I follow Jesus by choosing a new path of Living. Bummer - forgot to hit 'record' for the 4/30/2017 worship service, so no video for this week. April 30, 2017, Second Sunday after Easter: Welcome to Worship! We continue to celebrate the core of the Christian Faith ... the Good News message of Easter ... Christ is Risen! Message: "Have you believed because you have seen me?" John 20:19-29 Now Thomas (also known as Didymus), one of the Twelve, was not with the disciples when Jesus came. So the other disciples told him, “We have seen the Lord!” But he said to them, “Unless I see the nail marks in his hands and put my finger where the nails were, and put my hand into his side, I will not believe.” A week later his disciples were in the house again, and Thomas was with them. Though the doors were locked, Jesus came and stood among them and said, “Peace be with you!” Then he said to Thomas, “Put your finger here; see my hands. Reach out your hand and put it into my side. Stop doubting and believe.” Thomas said to him, “My Lord and my God!” Then Jesus told him, “Because you have seen me, you have believed; blessed are those who have not seen and yet have believed." April 23, 2017, First Sunday after Easter: Welcome to YouTube Worship! The core of the Christian faith is the Good News message of Easter…Christ is Risen! The resurrection of Jesus gives us a foundation on which to build our faith. Message Questions on the Road with Jesus. Jesus will see you through. Apologies, the camera record button didn't get pushed. John 11: 17-45 NIV, Red Letter - Jesus' encouragement. March 26, 2017 Sermon Series: Questions on the Road with Jesus “Who has sinned?” John 9:1-41 Jesus heals a man born blind. John 4: 4-26 Jesus meets the Samaritan woman at the well. 5:11: Blessed are you when people insult you and persecute you and say falsely all kinds of evil. Rejoice and be glad. 5:16: Let your light shine before others that they may see your good deeds and glorify your father in heaven. 5:22: Anyone who is angry with a brother or sister is liable to judgement. 5:28: If your eye or hand causes you to sin, remove it - it is better to lose a body part than to go to hell! 5:37: Let your yes be yes and your no be no. 5:42: Give to the one who asks you and do not turn away from the one who would borrow. ​5:44: Love your enemies and pray for your persecutors. 6:14: If you forgive others when they sin against you, your heavenly Father will forgive you. 6:19: Do not store up treasures on earth but store up treasures in heaven. 6:24: No one can serve two masters…you cannot serve both God and money. 9:37: The harvest is plentiful but the workers are few. Ask the Lord of the harvest to send out workers. 11:28: Come to me all you who labor and are heavy laden and I will give you rest. 16:24: Whoever wants to be my disciple must deny themselves take up their cross and follow me. For whoever wants to save their life will lose it but whoever loses their life for me will find it. 16:21: I must suffer at the hands of men, die and rise again. The Lenten Challenge: Matthew 6:1-18 In Lent, make a commitment to: a) Regular Prayer, b) Anonymous Generosity, c) Fast supper to supper. All for the purpose to grow in relationship with Jesus. money or it could be something else...be creative. 2. Set aside a time for prayer each day for at least 5 minutes. next day. You are only missing two meals and snacks. February 12, 2017. "A Higher Standard" Matthew 5: 21-48 Jesus' teachings in Matthew 5, are about the matters of the heart... a higher standard for your heart. February 5, 2017. "Who are You?" You are the salt of the earth.... You are the light of the world... Jesus. Grace and peace to you, Friends, I have said many times that we Christians are not primarily citizens of a nation or of this world. Our primary citizenship lies in the Kingdom of Heaven. Our primary leader is not the president or the governor or the bishop or our pastor. Our primary leader is Jesus. All teaching, preaching, executive orders, declarations, and laws of this world must be filtered first through our understanding of who Jesus calls us to be and how he calls us to live. This past Sunday’s message focussed on Jesus’ teaching in the beatitudes of Matthew 5. I tried to make the case that this teaching shows us the kind of character Jesus wants us to have as his followers. 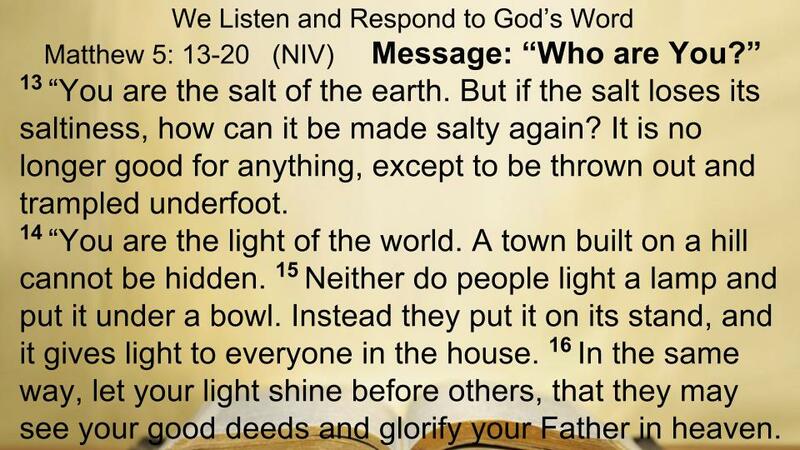 This week we talk about why that is important…because Jesus calls us the "salt of the earth” and the “light of the world”. Jesus calls us to be visible in the world. For him, and for his Kingdom. Our world is very divided right now. We all must ask ourselves what the Christian response is to the events of the day. I pray that none of us will follow party lines or personalities of the hour, but that we would follow Jesus. And allow our lives to be transformed by the Holy Spirit to shine forth and give reasonable responses to the issues of the day. I would also ask you to remember that when I speak, I am seeking to speak from a Biblical perspective, applying what I know and have experienced through that filter to help us move forward as followers of Jesus. God bless you richly. Remain in prayer for our spiritual leaders who are seeking to be salt and light in our world. d.
January 29, 2017 "The Character of a Disciple" God make me more merciful and pure in heart. Fill me with the sense of righteousness. God help me grief over my sin and be ready to move forward in a new way of life. God make me a peace maker. Matthew 5: 1-10 I am Blessed. Sunday’s text was from Matthew 4, verses 18-25. Jesus calls the fishermen to follow him and begin “fishing for people”. An illustration that I use in the message is that we have lost sight of this very basic mission of the Church. We have anchored our boat, pulled up the nets, put on suntan lotion and are resting in the goodness of our life together and not fishing. Or, we have pulled the boat ashore and found different jobs…caring for the building, attending Bible studies and prayer groups, giving money and worshipping…(all of which aren’t necessarily bad things) but we have given up the core mission of fishing. Our future and the future of every congregation is whether or not we are actively engaged in fishing for people! Our neighborhood is being regularly “stocked” with new people. They move in every month. How will they come to know Jesus if we don’t go fishing? God bless you richly today! d.